You know when something’s probably bad for you, but you do it anyway? Energy shot and drink consumers certainly fall into that category now, according to one new bit of research, anyway. Nearly six in 10 Americans who currently consume energy drinks or shots say they worry about the safety of the drinks, according to research by Mintel, a market research firm that has a focus on the food and drink industry. So take that how you will. Consumers might be on the right track with that one. Last year, the Substance Abuse and Mental Health Services Administration reported that when you guzzle an energy drink, you can experience palpitations, spikes in blood pressure and other not so fun experiences. 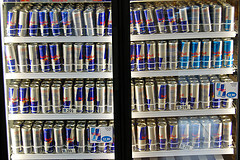 And in September, a family sued Red Bull, blaming the drink for the death of a Brooklyn man. But when asked why they consume the beverages, more than half the respondents to Mintel’s survey said they were more effective than other beverages. One-third of respondents said the drinks are convenient, while 31% just like the taste. Really? The taste? Okay, if you say so. Anyway, although consumers might be wary of what they’re putting in their bodies, sales in the energy drink, shot and mix category have continued to grow since 2008. “Energy drinks and shots faced significant scrutiny following lawsuits and proposed legislation that began in 2012. The media attention publicly challenged the safety and health effects of this pick-me-up category,” said Jenny Zegler, global food and drink analyst for Mintel Food & Drink, in a press release. Of the consumers that do stray from the cult of energy drinks, 39% say they do so because the drinks aren’t good for their healthy, while 35% say they have heard negative information about health effects. Would You Still Eat That If You Knew How Much Exercise It’ll Take To Burn It Off?